How did I not know about this movie before? What a beautiful story. The movie was a great mixture of romance, fantasy and comedy. For some reason, throughout the film I kept thinking of “The Curious Case of Benjamin Button” and inevitably began to compare the two films. At the end, I believe this one to be far superior. In my opinion, “The Curious Case of Benjamin Button” attempted to be a serious, emotional film, but lacked the substance to really have an impact and ended up being quite average. Basically, I feel like it took itself too seriously. 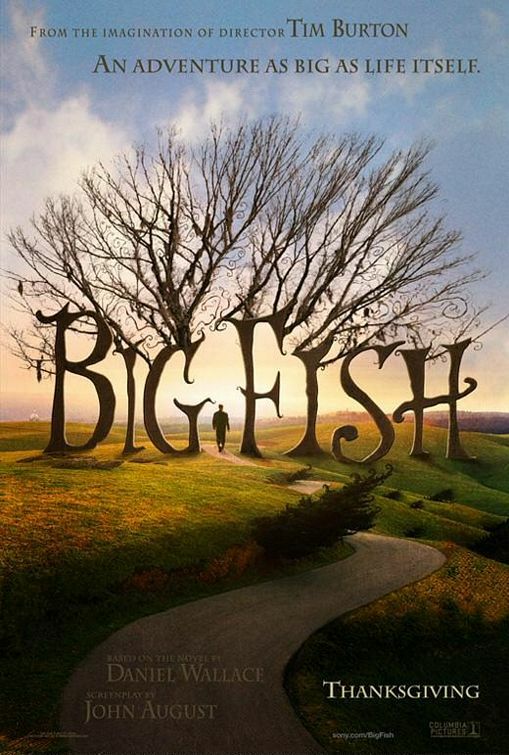 “Big Fish” however, used Tim Burton’s usual quirkiness to great effect, with the epic fantasy adventure combined with the more serious romance, creating a much more engaging story. The acting was great, but strangely enough, I appreciated Ewan McGregor’s lead performance the least, solely due to his annoying “Little House on the Prairie” southern accent. But that was the nature of the character, so I guess I can’t fault him for that. Sorry if I've been bombarding you with foreign films lately, but I feel like I've exhausted all Hollywood movies of interest for now. I wasn't raving about this film, but it's definitely a good one and it's the best movie I've seen recently. It had some good camera work and had one of the best endings I have ever seen. In fact, I think the ending pushed it over "The White Ribbon" and "A Prophet" for the Oscar, much like the flashback montage in "Up" pushed it to a Best Picture nomination and the win for Animated Feature. I don't want to divulge any more, in case any readers plan on watching it. If you like a good murder mystery, check this one out. I didn’t see anything worthy of “Movie of the Week” this week, so I chose a movie I saw a couple weeks back – “The Last Station”. This movie left a lasting impression on me, I am still thinking about it. A major reason was the performance of Helen Mirren. Damn, that woman can act! She really threw herself into this character and you cannot help but feel for her. You really experience the intense frustration of someone who feels their life is being taken away from them and no one seems to care. In addition to Mirren, the rest of cast is superb, including an equally strong performance by Christopher Plummer and expectedly good performances from Paul Giamatti and James McAvoy. I really don’t understand how this film didn’t get more attention in the Oscar race. To me, this film had everything – great scrip, excellent cast, art direction, costume design. “The Blind Side” was nominated for Best Picture. Enough said. Well, it seems I’ve been plagued with bad movies recently. Here’s another “rotten tomato” for you. When I realized that the movie wasn’t actually in its original (it was dubbed in English) language, I let out a big groan. If you’ve seen a dubbed martial arts flick, you know what I’m talking about. The dubbing always makes the lines sound so corny. That being said, I don’t think the dialogue would have been that much better in subtitles. I lost interest halfway through the film. I am now certain that kung fu/martial arts flicks aren’t my style (I kinda hated “Crouching Tiger, Hidden Dragon”). I must say however, the fighting scenes were damn cool. I wish they would skip all the dramatic parts and just fight for a ½ hour. Yes, this must be the most random film ever, but it was nominated for an Oscar(Best Foreign Language Film)! Unfortunately, this film just flatlined and never recovered. It was just too boring and I thought the plot was very weak. Surely there were better foreign language films last year?